When you protect your pool this winter you’ll be mighty glad you did next spring! 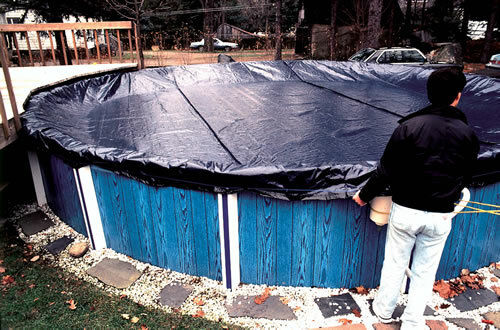 When combined with a proper winterizing program, The GLI Solid Winter Cover will protect your pool from the wear and tear of freezing winter weather and eliminate costly maintenance and spring cleanup. Made from tough polyethylene fabric – Time-tested! It’s the toughest, most durable material available. Won’t crack, split or tear from the cold! Lightweight – Easier to put on and take off the pool than heavier, bulkier vinyl covers. Takes up less room to store, too! Competitively priced – We dare to compare with all others! GLI offers 30 years of experience in the manufacturing of winter covers. We use the best material with the highest concentration of UV stabilizers to ensure your cover will last for years. We also back our covers with the best warranty in the business. Why use a winter cover? Keeps pool water clean and free from dirt, leaves and debris. Eliminates costly maintenance and spring cleanup.